Many adopted children can find school difficult. They will often display complex behaviour due to the trauma they experienced at critical times in their development. Consequently, the new environment may make them feel threatened and unsafe and this disrupts their learning. a request of an assessment of your child’s special educational needs from your local authority. Early Years Pupil Premium – £2300 of extra funding for every adopted 3 and 4 year old in early years education. Pupil Premium – £2300 of extra funding for state-funded schools to help meet each adopted child’s educational needs. This video tells of the range of behaviours that an adopted child may be struggling with but are not always recognised as being a result of earlier damaging experiences. Not all adopted children need additional help in school, but it is better for adoptive parents and teachers to be prepared to help those who do need extra support. We know that the children who have come into the care system have experiences of distress and trauma which can affect their behaviour, especially in group settings such as school. If strategies are not in place to enable them to cope then learning opportunities are lost and children are labelled as being withdrawn or having difficult and challenging behaviour. Children who have joined their adoptive families in the years before formal schooling are still building a secure attachment to their new parents. Going into a school group setting will trigger stress which perhaps leaves them anxious and they may find it difficult to control their impulses without their parent to help calm them. In Getting it right for every child by Adoption UK, you can read how hard it is for many adopted children to settle in school because of the panic of dealing with new experiences, the expectation that they can absorb new information, develop new friendships and begin to learn. However, there are lots of ideas to help parents and teachers, working together, to put in place strategies which will support your child and make school and learning more enjoyable. 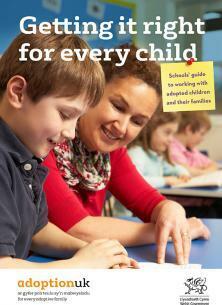 PAC-UK’s Education Service offers a wide range of training and materials for schools and adoptive parents. The Adoptables, a national network of adopted young people aged between 13 and 25 have developed, together with Coram Life Education, a toolkit for schools. The aim is to enable teachers to plan lessons that will improve awareness and understanding of adopted young people’s experiences at school. The Toolkit includes lessons with video scenarios for children in Key Stage 2 and Key Stage 3 which will provide opportunities for the class to discuss and think about being adopted and how adopted young people can be supported in school. For details of other dedicated organisations that offer training and support for school staff of adopted children, search our database of adoption support providers.